From the creators of the delightful wholefood cafe in Elanora Heights, The Nook (which I shared with you a couple of years back), Adam and Carla have taken their passion for organic fare further afield, around ‘the bends’ in fact to set up their second offering, Forage Wholefoods Cafe and Organic Grocer in Clareville, NSW. Fish tacos are such a simple and healthy way to enjoy fresh fish and combined with a refreshing pineapple salsa and creamy lime mayonnaise, these are hard to beat. A delicious array of flavours and textures in this vegetable lovers’ delight! This recipe can easily be prepared and assembled the day before and refrigerated, then baked an hour before meal time. Any leftovers are tasty served cold for the next day or two, with a simply dressed garden salad. It has become a Christmas tradition (when we are at home with an oven to use) to honey glaze a beautiful smoked ham, either a half or a whole leg. The leftovers make a necessary addition to the camp fridge when we head off on our summer road trip. I am thankful for my lovely friends farmer Greg and Lauren Newell from Linga Longa Farm, who supply us with their delicious smoked leg of ham at our local farmers market, The Beaches Market. My husband Paul grew up eating fresh caught and cooked school prawns. Although they are laborious to peel, he has now convinced me that they are the sweetest and tastiest prawns you can eat. This salad was inspired by a kilo of ‘as fresh as you’ll find’ school prawns, that we were fortunate enough to purchase from a local fisherman just cooking his morning’s catch on the shores of Lake Macquarie last summer. 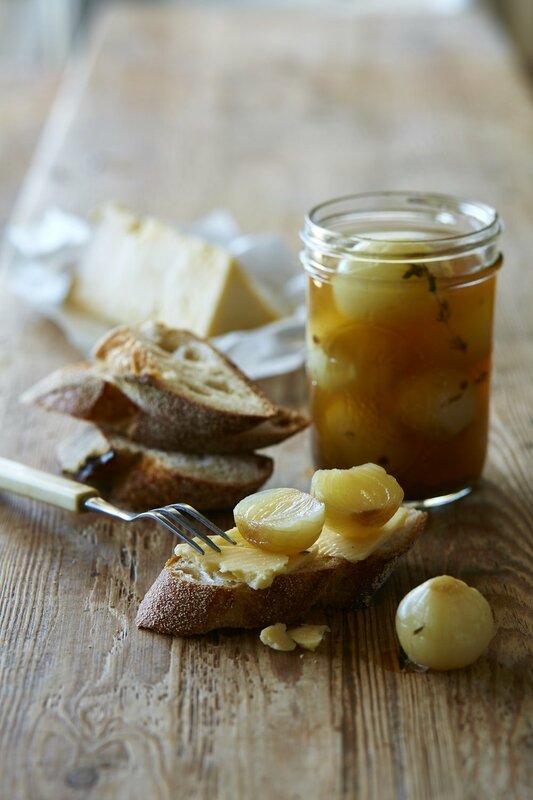 This makes a perfect Christmas Day dish! These wholesome gluten-free muffins will deliver you double the chocolate taste, with the nourishment of quinoa flour, almond meal and natural yoghurt to sustain you. I like to make mine large, giving you six decent sized muffins, but they will work just as well smaller, giving you a dozen from this recipe. 1. Preheat the oven to 180°C (160°C fan forced) and lightly grease 6 large (160ml) or 12 medium (80ml) muffin tins. 2. Using electric beaters, beat the butter and sugar until light and creamy. Add the eggs and vanilla bean paste and beat to combine. Add the remaining ingredients except the chocolate pieces and mix well. 3. Spoon the mixture evenly into prepared muffin tins. For larger muffins use a ½ cup measure per muffin, for smaller muffins a ¼ cup per muffin. Evenly disperse the dark choc pieces between all muffins, poking them into the top of the batter. 4. Bake large muffins for 30 minutes, or medium muffins for 20 minutes or until skewer comes out clean when inserted into the centre of the muffin. Lift out onto a wire rack to cool. Note: It is doable and worthwhile to make your own almond meal. Process ¾ cup (100g) whole raw almonds to produce the required 1 cup of almond meal. Left over almond meal is best stored in the refrigerator in airtight glass jar. Storage: To freeze muffins wrap in non-stick baking paper, then place into an airtight snap lock bag with the excess air expelled. A visit to Norway means magnificent scenery; I’m talking “super fjords” as far as the eye can see and hair-raisingly narrow mountain roads to navigate. There’s sensational seafood to eat and a fiercely patriotic and affable Norwegian people to share it all with. 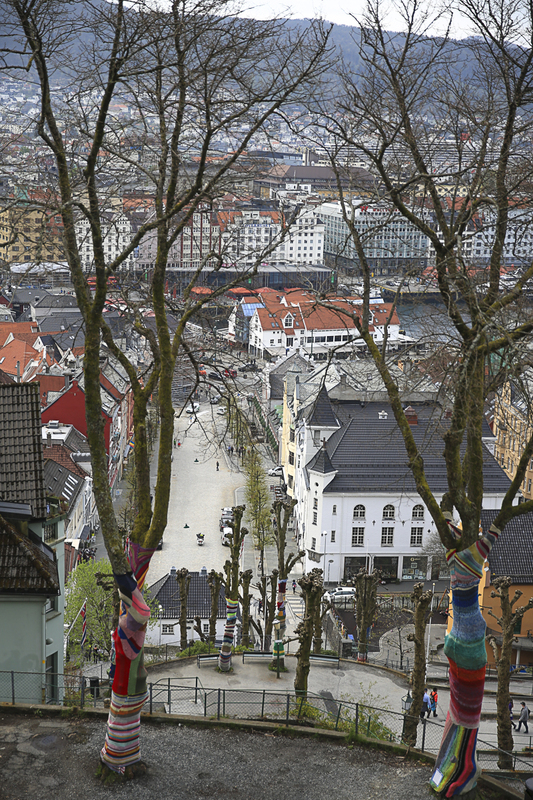 Bergen is Norway’s second largest city, and lies clambering up the mountainsides, overlooking the sea, embracing you. You can roam through living history in this modern city, before continuing on to explore the wildest and loveliest fjords of Norway. 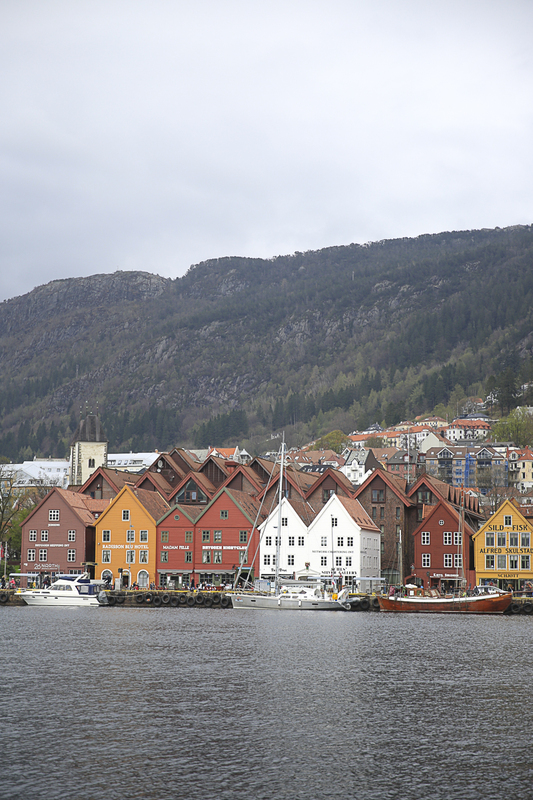 On a Norwegian scale, Bergen is a large city, but one with a small-town charm and atmosphere. Its passionately patriotic inhabitants are proud of their many-sided city and its history and cultural traditions. We adored our three days exploring Bergen, walking and eating our way around this vibrant city. Absolutely determined to eat like Norwegians rather than tourists, we took some helpful advice from a local chef on where to go for the best Norwegian fare and then cobbled together our very own little food tour of Bergen. As we walked the cobblestone streets, it was like a step back in time, weaving our way from our hotel Zander K, located near the central train station, down intimate laneways to the harbour and the wharf area, known as Bryggen. There the landscape is a fanciful array of colourful old buildings, housing cafes, restaurants, hotels and little shops selling mink fur coats and leather goods. We visited the out-door fish market, a collection of stalls located on the waterfront, where we tasted hot smoked salmon with fragrant spices, and smoked whale meat was also on offer. The Fisketorget (the indoor fish market) which is somewhat more upmarket and pricey to match, was a joy for Mr G to browse, seeing varieties such as monk fish, halibut, place, salmon, mackerel, sweet shrimp, crayfish and king crabs. Across the road, another seafood stop worth visiting was Strandkien Fisk, where we headed to grab a couple of the much talked about Norwegian fish cakes; lightly fried, fluffy on the inside and crisp on the outside. To really see this city, it’s best to see it from high up. Bergen is surrounded by seven mountains and it’s worthwhile heading up one of them to capture the view. The Flobanien, a funicular that runs from behind Bryggen, will conveniently have you up high on Mount Floyen in fifteen minutes. However, we decided to get some exercise doing the forty five minute walk to the top, filling up on fresh air instead. The panorama of the surrounding city and waterways, was more and more spectacular the higher we went and there’s nothing better than a brisk uphill climb to stoke the appetite, particularly when you have planned to lunch at one of Norway’s finest restaurants, Lysverket. 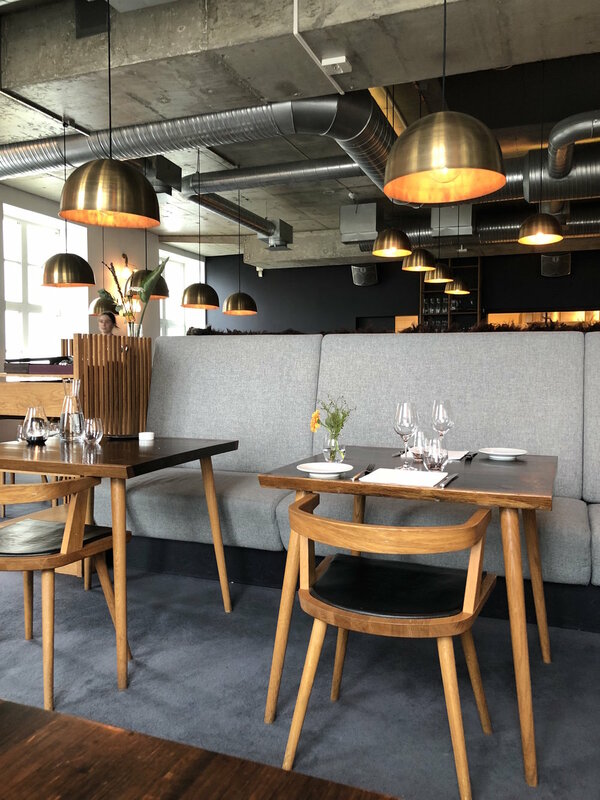 Lysverket is such a beautiful light filled space, the food so well executed and the service from a young French girl, currently studying in Bergen, was warm and friendly. The restaurant is located in the art museum KODE 4 at the Grieghallen, overlooking a fountain-laced park, in the heart of Bergen. All the ingredients here are foraged or locally sourced by Norwegian native and head chef Christopher Haatuft (ex Per se chef in New York). Mr G opted for the famed Fiskesuppe (Bergen Fish Soup), here they serve a modern take on the traditional Bergen fish chowder, presenting a creamy soup with large pieces of fish and root vegetables, finished with a drizzle of leek oil and pickled celeriac - served with sourdough bread and organic butter. 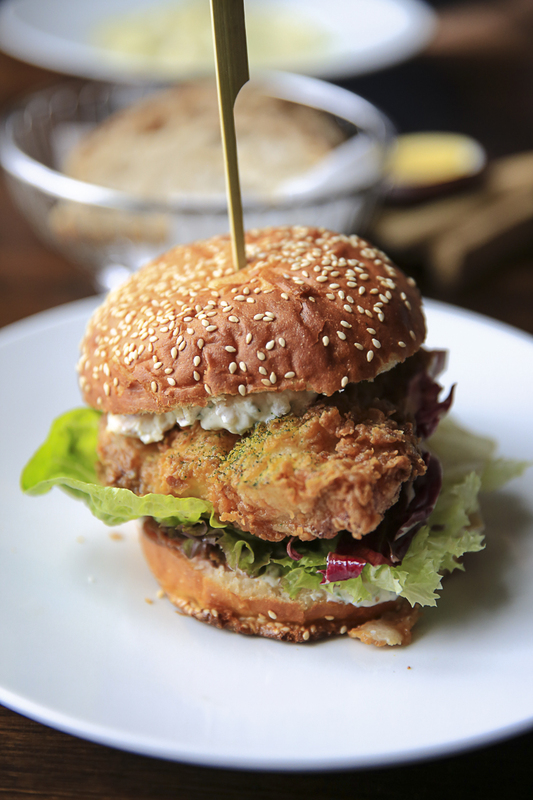 I chose to get messy with the Fried Fish Burger, a succulent piece of cod, enclosed in a crunchy crumb, with kimchi and yoghurt dressing served on a seeded brioche bun. The food was simple and delicious and a true taste of local Norway. 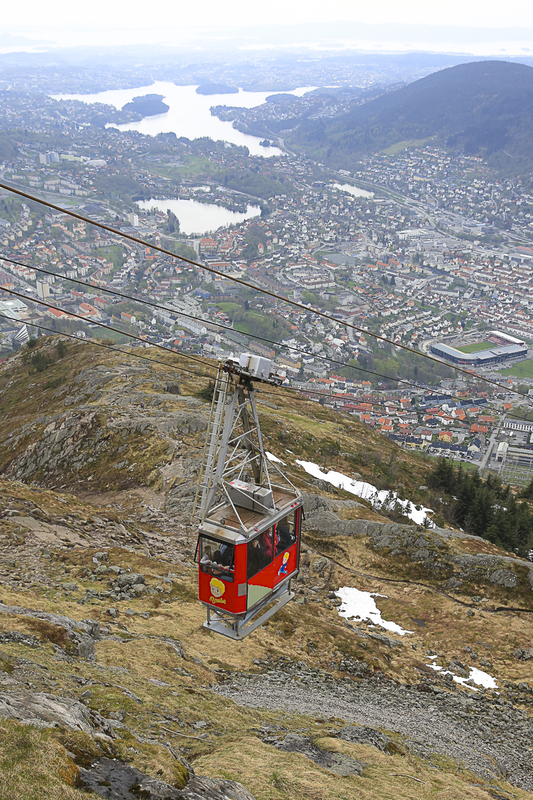 For our second panoramic experience of this picturesque city, we took the Ulriken643 cable car to the very top of the highest mountain in Bergen, Ulriken. It’s not for the faint hearted, another hair-raising ride with exceptional views as you go, and in early Spring there was still a little snow on the ground at the top. You can also hike this mountain and many were, however we opted for the cable car and it was a whole lot of fun. For our final night in Bergen, we dined at Pingvinen, a relaxed eatery/bar said to be serving up the ‘real deal’ in Norwegian fare. Tucked in a little cobblestone side street, this homely little pub on a corner was the epitome of “no frills”, except for the lace curtains on the front window. The place was packed with locals and tourists eating and drinking, enjoying the locally brewed beers. I had my first taste of Norwegian meatballs served with mushy peas, potatoes, gravy and lingonberry jam, while Mr G had the wild deer (locally caught in Flam) stewed with mash potatoes. We felt like apprentice Vikings gobbling into such hearty fare! One thing Norway certainly is not, is a bargain holiday destination. We found it expensive to eat out and get around,* however it was often only a small gap in pricing between eating westernised “rubbish” tourist food and seeking out the finer dining or local out of the way places to dine. It was really worth the research and a few extra dollars invested, to eat the Norwegian fare and get a real taste of Bergen, Norway. *Another Traveler's Tip: It is particularly expensive if you hire a car to get around, high fuel costs, unavoidable toll roads and car ferries to pay for. However, being that we are not fans of the organised bus tour and cruise ships, where one is subject to another’s timetable and agenda and at the mercy of the habits of unknown traveling companions, we chose the self-drive option for the next ten days we spent exploring more of Norway. This afforded us the luxury and freedom of thoroughly traversing the countryside, crossing the tapestry of fjords it boasts and stopping for fjord side picnics and magical photo opportunities anywhere along the way we felt inclined.